Our Toddlers are the older babies, aged 18-24 months (approx). There is a maximum of 6 toddlers with a minimum 3:1 child to adult ratio. 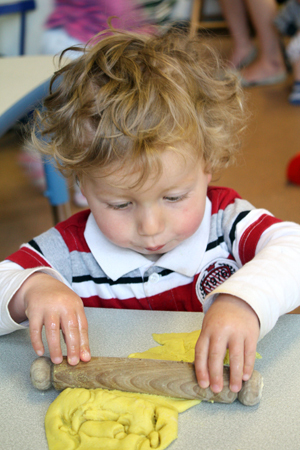 The toddler group integrate and play alongside the Two’s group which ensures there is a smooth transition once they turn 2-years-old and join the Two’s group. Abracadabra is a free-flow nursery which allows children the freedom of choice and independence whilst maintaining a routine. The Toddlers and Two’s have 4 rooms available to use, with only 2 being accessed during free-flow, as well as daily garden play whether rain or shine. Activities are planned for in advance and we follow monthly topics. A day sheet is given to each parent which informs them of how their child’s day has been, which is supported by a comprehensive verbal handover.